SOUTH BEND, Ind. 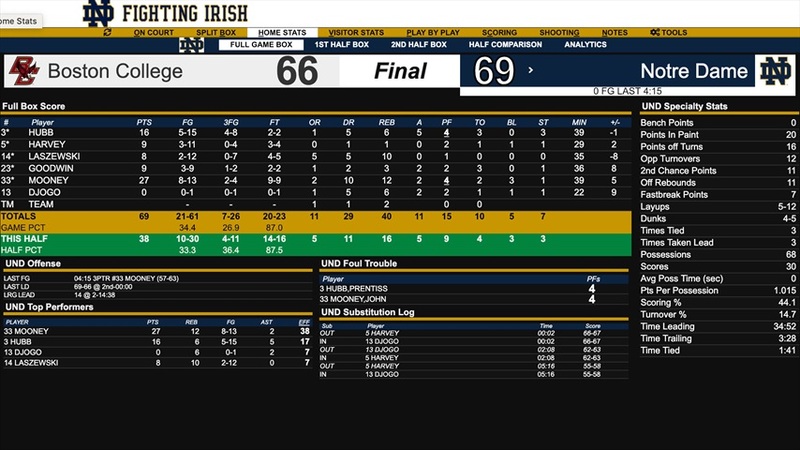 - Notre Dame was already down Robby Carmody and Rex Pflueger due to season-ending injuries, but it got worse for the Irish on Saturday as Juwan Durham (ankle) was listed as out. But that wasn’t all for Mike Brey’s squad as leading scorer TJ Gibbs fell ill during warmups and was a late scratch from the lineup. 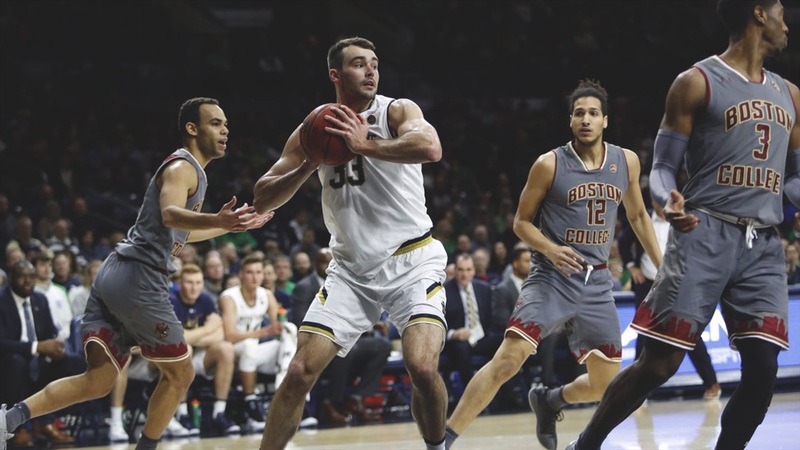 Behind a gritty performance from John Mooney, 27 points and 12 rebounds, Notre Dame (11-5, 1-2) got its first win in the ACC as the Irish held off Boston College (9-6, 0-3) 69-66 with just a six-man rotation. “I’m proud of our group. A lot of different guys stepped forward and made plays to get out of here with a win. The Irish used an 8-0 run early in the second half to take a commanding 49-35 lead but then went into a scoring drought of 2:44 to allow the Eagles to cut the lead to 49-40. Ky Bowman led the charge for Boston College as the junior scored 24 points and pulled down 16 rebounds but scored eight points halfway through the second half to cut the Irish lead. 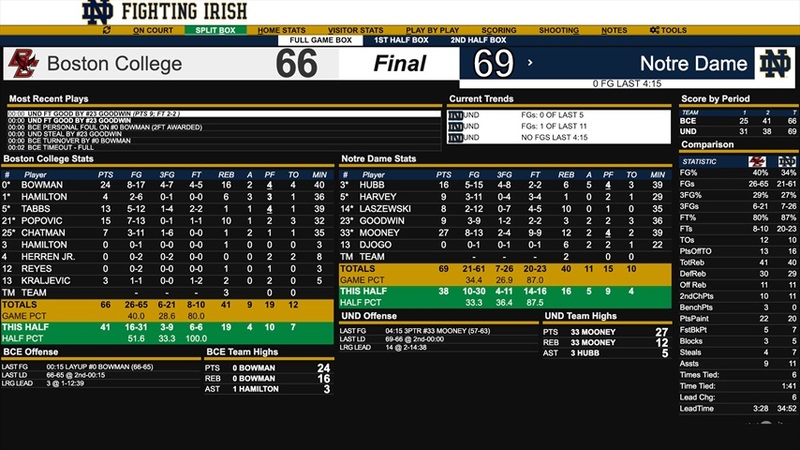 Notre Dame once again found themselves up 51-44 but then used a quick 7-0 run to push the lead back to 59-47 with eight minutes to play behind big buckets from freshman Dane Goodwin. Boston College didn’t go away as they took the lead in the final seconds of the game as Bowman got a fast break layup to take a 66-65 lead with 15 seconds to play. Following a timeout, Hubb drove into the lane and got fouled going up for a layup. The 6-foot-3 freshman calmly nailed two free throws to give the Irish a 67-66 lead with two seconds to play. Hubb finally broke out of his shooting slump as he hit 4-of-9 shots, including going 3-for-6 from downtown in the first half to end up with 11 points in the first 20 minutes. The freshman point guard finished with a career-high 16 points while adding six rebounds and five assists. “I was going to bring Prentiss off the bench to try to help him,” Brey explained. “Then he starts and plays 40 minutes. I told them no one gives us a shot and let’s be a great story. I’m proud of our young guys. I thought the three freshmen really delivered. Behind Hubb’s hot start, the Irish used a 10-0 run to take a 19-12 lead after two free throws from Mooney with just under 10 minutes to play in the half. The Eagles got a huge first half from Ky Bowman to stay in the game as the junior point guard scored 12 points and pulled down seven rebounds, which included three three-pointers. However, offense was a struggle for both teams to end the first half. Notre Dame didn’t score for 3:11 while the Eagles were held 3:10 without a point. Boston College shot 29% in the first half, while the Irish shot a little better at 35%. Up Next: Notre Dame will travel to No. 12 North Carolina for a 9:00 PM ET tip in Chapel Hill on Tuesday.